Aprons seem to be all the rage these days. We have patterns for adults, children, and one of our designers even created a FREE (love that word!) 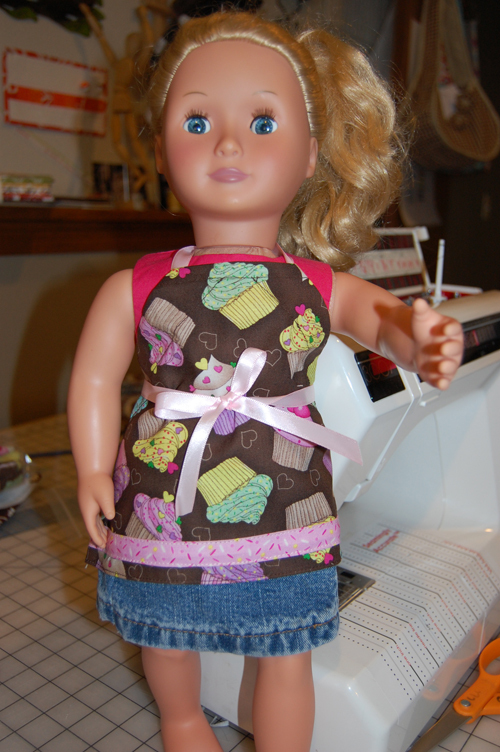 tutorial on how to make an apron for a doll. Let’s see what we have! Most of these patterns are available as downloadable ePatterns! It’s appropriate that this apron pattern was designed by a mother and daughter team. These aprons fit adults and children. It’s a fun project for anyone! As a bonus, Jen (the daughter) has designed a pattern for an 18″ doll (think American Girl Dolls). You can the FREE pattern here from Jen’s Blog. I’m betting her daughter’s doll has one! If you want to go a little simpler, try out this next pattern. This pattern takes only 1 yard of fabric! Customize the pockets any way you want, have fun with this! Get the Super Simple Apron Pattern here. “Retro” seems to be all the rage these days. Bring Retro into your kitchen! One size fits all. Get the Retro Clothespin Apron pattern here. Not thrilled with being in the kitchen? How about an apron that you wear in the sewing room? Get organized and have everything right at your fingertips! Get the Tool Apron Pattern here. If you want a sewing room apron that is tad fancier, then try Barb’s other tool apron. This one is asymmetrical with loads of pockets. Get the Sew It Goes Apron Pattern here. This is a cute trio of aprons. Mom can make one for herself, her daughter and her daughter’s favorite 18″ doll. Any little girl would love one! Get the Mommy, Dolly and Me pattern here. Aprons are fun, and they don’t need to be plain and simple. Let your inner Martha Stewart out and create an apron that is uniquely you! This entry was posted in patterns and tagged Aprons, Barb Sackel, Dawn M. Stewart, Jen Eskridge, Melissa Stramel. Bookmark the permalink.